This presentation starts with Jeane Manning who has the pulse of free energy technologies across the globe beyond most. 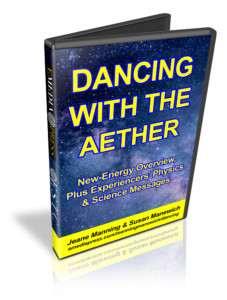 She will be sharing the basics of what the Aether is, the goal of cheap, clean energy available everywhere, why you don’t have to wait for exotic technologies and what path we are to take with this kind of abundance. Some specific technologies are reviewed such as Tewari’s Homopolar Generator tested at 238%, an electric car that recharged itself in some tests in 2016, a water fuel technology that uses about 97% water and a small amount of fuel and it only requires about 170 milliamps at 24 volts, a few plasma technologies and the latest in LENR (cold fusion), and others. There is an exciting mention of a new book Jeane is co-authoring with Susan Manewich called Hidden Energy, which will be released in the fall of 2018! If you’ve ever wondered if spirit can influence inventors, you’re in for a surprise that is backed by multiple, highly-credentialed PhDs. You’ll also learn how the balance of Yin & Yang are crucial to breakthroughs and a serious update on the grassroots movement to support these technologies. Some of these topics are highly controversial, but the data is insurmountable and is presented in a way that is balanced and objective. Susan worked with the late Dr. John Mack and she shares some of her experiences working in this most interesting field. What does a member of The Monroe Institute, a former head of the US Psychotronics Association, a former Harvard Professor of Astrophysics and editor of the Journal of Cosmology and the late Dr. Edgar Mitchell have in common? Susan Manewich was intimately involved in organizing the data that they all collected based on surveys taken by thousands of people. By analyzing the data, a very revealing picture comes into view and it appears there is non-human intelligence that has been influencing developers of breakthrough technologies. Susan also shares a never-before-seen interview with the late Guy Obolensky relating to the power of the mind. She was fortunate to have spent some time with him in his final days. Towards the end of the presentation, Susan covers a very important topic on moral responsibility with free energy technologies as they are sacred and should be treated as such. A business model is shared that anyone can use and takes the above concept into consideration. There are a fair amount of questions at the end that bring up many important points discussed throughout this presentation. There is a new use for carbon emissions that go into our atmosphere – turning it into plastic. Newlight Technologies breaks apart the carbon and oxygen and rearranges it into what they call Air Carbon, which is literally plastic made from the emissions.